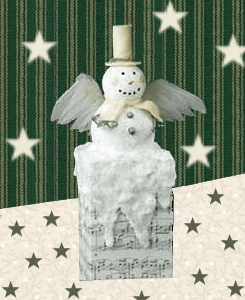 Wouldn’t this cute snowman look great upon your fireplace mantel or entry table? 2. Glue end of one toothpick halfway into bottom of 3″ ball. Apply glue to flat side of ball and glue other end of toothpick into center top of block. In same way, glue 2″ foam ball to top of 3″ ball, forming snowman. 3. Photocopy sheet music onto both card stock sheets; trim to 7″ x 8-1/2″. Wrap and glue card stock around sides of foam block, overlapping ends slightly. Note: Place large rubber bands around block to secure paper until glue dries. 4. Follow manufacturer’s instructions to apply foam paint to snowman and top of chimney, letting paint run down sides to resemble snow. While wet, sprinkle paint with fine, then ultra-fine, glitter. Let dry completely. 5. For hat crown, cut 2″ x 8″ piece from felt and tightly roll into 2″-tall cylinder; glue end to secure. Trace one end of crown onto felt twice; cut out one circle on line and one circle 3/8″ beyond line. Glue top and brim to crown; glue hat to head. Cut 3″ length from chenille stem and wrap around hat just above brim. 6. Paint allspice balls silver and let dry; glue to front of snowman’s body for buttons. For nose, paint one end of remaining toothpick orange; let dry. Cut tip from toothpick and glue to face. 7. Cut 3/4″ x 8″ scarf from felt and tie around snowman’s neck; spot glue to secure. Glue wings to back of body. 8. Cut remaining chenille stem in half; bend one end of each piece into small loop for hands. Glue and insert straight stem ends into sides of snowman. Dip pencil tip into black paint and dot eyes; repeat to make five dots for mouth. Use fingertip to apply blush to cheeks.